We always have so much fruit at out house and no where to store it. 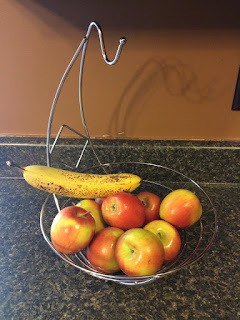 I was excited to try out the CARAT Fruit Bowl Basket with Banana Hanger. So if you like to display your fruit so you know exactly what you have then this is for you. This retails for $29.99 with prime and is a great size for the counter in our kitchen. It is chrome so it matches all of our colors and stainless steel we have all around our kitchen. It is pretty sturdy and holds a good amount of fruit and my kids can see what is there and pick what they want in it.